We all make mistakes. That’s true in our lives. And it’s true with our websites. Sometimes in the midst of building our websites we miss some very important bits – like making our phone number easy to find or not hiding our best content. The point of your website is to get people to do something. Yep, you want them to visit, you want them to find what they want and you want them to read you content. 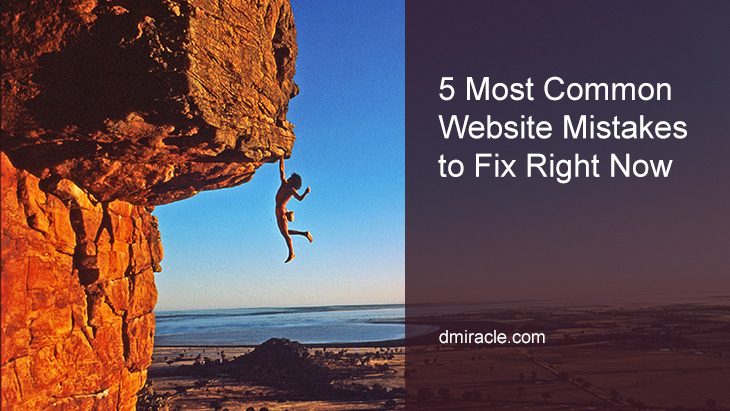 But the ultimate goal of your website is that they actually DO something. This is where your call-to-action comes in. You call-to-action directs your visitors to what they can do. Maybe it’s join your newsletter or share a post on Facebook. Maybe they sign up for a free consultation or get started with a DIY program. Whatever it is your call-to-action should be something they want, that’s useful to them, that’s of high value and that helps them begin to solve the problem they came to your website to get help with. At the same time, your call-to-action should meet your primary goal of your website. They subscribe to your list or join your Facebook group. The bottom line is they begin to get the help them need in a way that establishes them as a potential client. If your website doesn’t have clear, easy to understand, simply to do calls-to-action then you’re missing out on getting new clients. You need to know what people are doing on your website. What’s the most popular article or what pages are causing people to leave your site. Not tracking what people are doing on your website is one of the biggest mistakes you’re making. And, it’s one of the easiest things to remedy. Google Analytics is a great solution. It’s free and pretty easy to install on your site. And it will track all the information you need. Even if the idea of looking at your website statistics is completely overwhelming, you should still be tracking what people are doing. At some point it will become important to you. Just knowing how many people have come to your site each month is such valuable information you can’t miss it. Okay, so let’s just get this out of the way: no matter what all the ‘SEO people’ say, there is no magic formula to obtain high search engine rankings. We can’t just list keywords anymore or rely on having a handful of static website pages. Google wants to see new, updated content that’s focused around a key topic. Google has grown so smart that literally reads, understands and catalogs your content like a human being. So forget all the SEO tricks. Write content for people. Just be sure to focus your writing around a specific topic. The more specific the better. And to get SEO rankings today you have to blog. So if your website doesn’t have a blog or if you’re not using it regularly, you want to start. And just be consistent. Consistent can look like 2 times a week or it could look like once a month. The frequency is less important than the consistency. Just know that the more your publish the faster your search rankings (and your traffic) will grow. If the point of your website is to have people hire your for your service, then why would you not make your contact information easy to find? Yep, have a contact form on your contact page. Include your email address in the footer. But also put your contact info in your content. Put your phone number in the header of your site – or close to the top. Make it extremely easy for people to contact you. And one tip, make your phone number a clickable link so that people can call you with a tap on their smart phones. Don’t know how, hire someone who does. The convenience you give people will get your more contacts. In today’s world, the biggest website mistake of all is not having a mobile friendly website. People are on their mobile devices constantly. Much more now than on their computers. So if you’re not providing them with a positive mobile experience you’re sending a negative message to people. You’re telling them that you really don’t care about how they want to view your website. You’re telling them your business isn’t important enough to be caught up with the times. You’re telling them that you don’t care about serving them as a client. And now with Google penalizing sites that aren’t mobile friendly, you’re also telling Google you don’t care about how you rank in search results. Mobile isn’t going away. Computers are. Make sure your website is mobile friendly. Your website is the hub for your business. Whether it’s for SEO or social media, a resource for referrals or an information guide you want to be sure you’re not making these 5 mistakes. Questions? Need an evaluation of your site? Need help correcting these mistakes? Please be in touch. I can help.